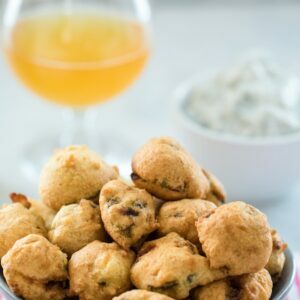 No matter your feelings on brussels sprouts, it's impossible not to love these Beer Batter Fried Brussels Sprouts. Served with a blue cheese yogurt dip, you won't be able to stop eating these sprouts! Bring a large pot of lightly salted water to a boil. Add halved brussels sprouts and let cook for 7 minutes. Drain sprouts and wrap them in a clean kitchen towel to dry as much as possible. Pour canola oil in a deep pot so it's about 2" deep and heat to between 365-400 degrees. While oil is heating, mix flour, cornmeal, salt, and cayenne in a large bowl. Stir in egg and beer. When oil is hot, work in batches to dunk sprouts in batter and carefully drop in the oil. Let fry for about 4 minutes, until they're golden brown. You'll likely have to adjust burner level to keep oil temperature in the right range. When sprouts are golden, remove from oil and place in a paper towel-lined bowl. Continue until all sprouts are fried. In a medium bowl, mix together all of the ingredients. Keep chilled until ready to enjoy. Dry sprouts as much as possible after blanching. Water remaining on sprouts may keep them from getting crispy. Make sure beer is chilled. Room temperature beer may result in a less crispy coating. Keep oil between 365 degrees and 400 degrees. If oil temperature drops below this, sprouts will not crisp up as they should.